China’s 4 Trillion Yuan stimulus in November 2008 may have been successful in allowing China to escape from the Great Recession. But the massive increase in local government debt in the implementation of the stimulus package also led to crowd out of the more productive private sector investment. Yi Huang of Graduate Institute in Geneva and his coauthors Marco Pagano and Ugo Panizza discuss this "dark side" of the Chinese stimulus. China reacted to the global financial crisis with a massive fiscal stimulus. In November 2008, the government announced a package worth 4 trillion Yuan (approximately 590 billion USD). The plan was implemented immediately and most of the funds were channeled through local governments. The stimulus package focused on investment. In 2009, the growth rate of fixed capital formation nearly doubled with respect to the pre-crisis period and the contribution of fixed investment to Chinese GDP growth was close to 90 percent (Wen and Wu, 2014). This surge in investment was achieved by injecting financial resources into state-owned firms and local infrastructure projects. There is evidence that under the stimulus plan, new bank credit was disproportionately given to state-owned firms rather than to more productive private firms (Deng, Morck, Wu, and Yeung, 2015; Cong and Ponticelli, 2016; Ho, Li, Tian, and Zhu, 2016; Bai, Hsieh, and Song, 2016; and Ru, Gao, Townsend, and Yan, 2017). At first glance, the stimulus was a resounding success. China escaped the Great Recession and became one of the main drivers of world economic growth (Wen and Wu, 2014, and Ouyang and Peng, 2015, among others). However, this was at the cost of exacerbating a long-standing problem in China’s economy; namely, that high-productivity private firms fund their investment out of internal savings while low-productivity state-owned firms survive thanks to easier access to credit (Song, Storesletten, and Zilibotti, 2011). In a recent paper (Huang, Pagano, and Panizza, 2016), we show that the massive increase in local government debt that resulted from the stimulus package did indeed crowd out investment by private manufacturing firms. Local government debt rose from 1.2 trillion (5.8 percent of GDP) to 12.5 trillion Yuan (22 percent of GDP) between 2006 and 2013 (Figure 1), based on data for local government financing vehicles (LGFVs) in 261 prefectural level cities. [Our data cover total debt (bonds plus bank loans) owed by Local Government Financing Vehicles.] While bond issuance has grown dramatically in recent years (from 6% of total LGFV debt in 2006 to 21% in 2013), the volume of bonds outstanding is far less than the total debt, which actually consists mostly of bank loans. In an integrated nationwide financial market, there is no reason to expect local government debt to affect local investment; the issuance of local government debt triggers an increase in local interest rates, drawing in capital from the rest of the country and also possibly causing an increase in local savings. Eventually, the greater share of local public debt is held by investors throughout the country and any crowding-out of private investment occurs at the national level. [The hypothesis of segmentation is not necessary if external investors have a limited appetite for a certain jurisdiction. In a study of 15 emerging market countries, Agca and Celasun (2012) show that external public debt crowds out external borrowing by private corporations.] However, if the financial market is geographically segmented, the imbalance and its impact on investment is localized. This is in fact the case in China, whose financial market segmentation is well-documented in many studies (Dobson and Kayshap, 2006; Roach, 2006; Boyreau-Debray and Wei, 2004 and 2005; Allen, Qian, and Qian, 2005; Brandt and Zhu, 2007; Dollar and Wei, 2007; and Firth, Lin, Liu, and Wong, 2009). In such a situation, unless local savings increase for other reasons, placing additional local public debt with local banks requires a one-for-one tightening of credit to the local private sector (less than one-for-one if there is imperfect segmentation). In our study, in order to investigate this local crowding-out hypothesis, we merge city-level information on local government debt with a nationally-representative survey that covers more than 350,000 manufacturing firms and uses three different empirical strategies. Using city-level data, we document that the investment of private manufacturing firms is significantly lower in cities with a larger issuance of local government debt, while state-owned and foreign-owned manufacturing firms is not affected by the issuance of local government debt. Using industry-level data, we investigate whether local government debt is particularly damaging for industries that need more external funding. This approach allows us to investigate whether government debt affects investment by tightening private firms’ credit constraints. It also allays endogeneity problems by allowing us to control for city-year and industry-year effects. 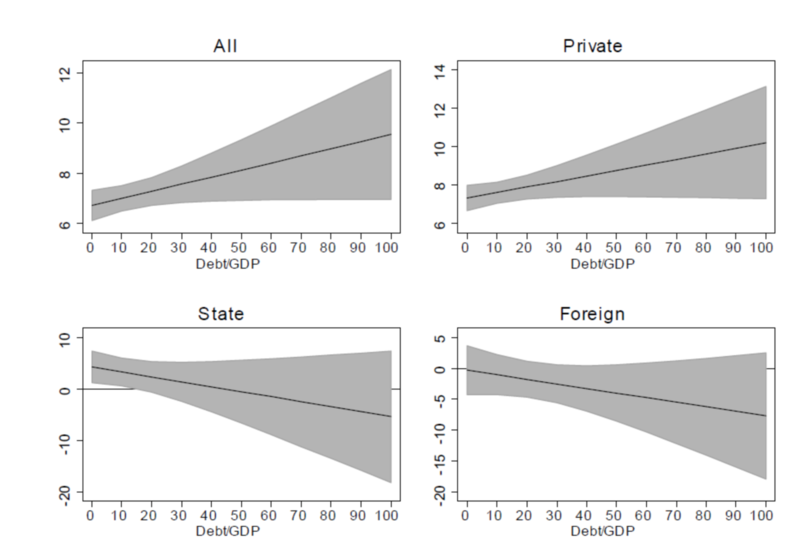 We show that local government debt is associated with a significantly lower investment by domestically-owned private manufacturing firms that need external financial resources, but is not associated with the investment of state-owned and foreign-owned manufacturing firms. Using firm-level data, we test whether local government debt tightens credit constraints; we do this by testing whether local debt issuance increases the cash-flow sensitivity of investment for firms that are likely to be credit-constrained. Our focus on firm-level data allows us to rule out concerns of reverse causality from investment to local government debt. Consistently with our previous estimates, we find that local government debt affects cash-flow investment sensitivity for private sector firms but not for state-owned and foreign-owned firms (Figure 2). Our results are robust to jointly estimating an investment equation and an equation measuring the likelihood that a firm is credit-constrained. It contributed to the rapid growth of shadow banking (Acharya, Qian, and Yang, 2016; Chen, He, and Liu, 2016; Chen, Ren, and Zha, 2016; Elliot, Kroeber, and Qiao, 2015; Hachem and Song, 2016; and Wang, Wang, Wang, and Zhou, 2016), whose assets increased from 4.5 trillion Yuan (14 percent of GDP) in 2008 to 11 trillion (27 percent of GDP) in 2010. 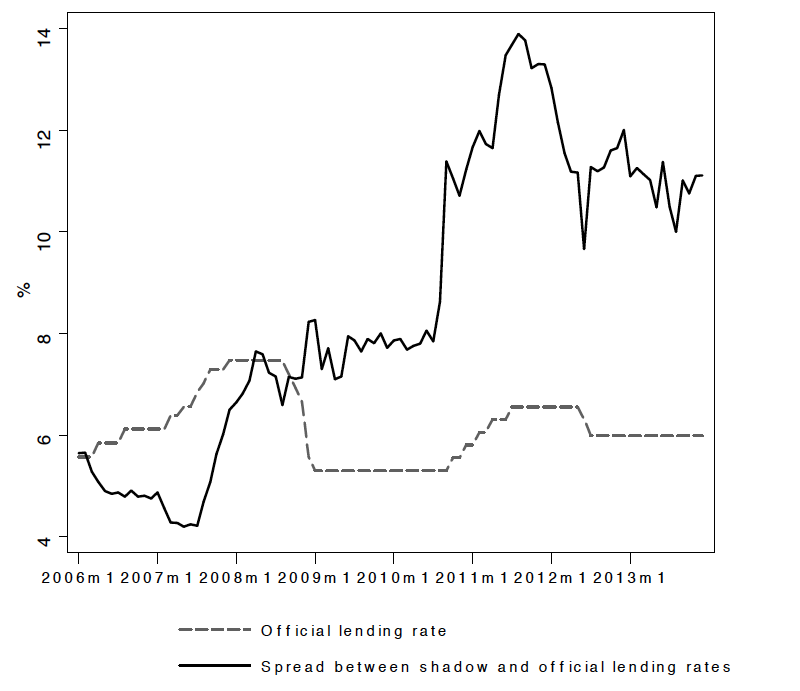 The doubling in size of the shadow banking sector coincided with a jump in the spread between the shadow lending rate and the official lending rate (Figure 3). It crowded out the investment of private firms by tightening their credit constraints. This reallocation of investment from the private to the public sector is likely to undercut China’s long-run growth potential, especially in the areas where local governments have issued the largest amount of debt. It strengthened the bank-sovereign nexus in China. This is a threat to systemic stability, as the Euro-area sovereign debt crisis has so forcefully demonstrated (Acharya, Drechsler, and Schnabl, 2014; Acharya and Steffen, 2015; and Altavilla, Pagano, and Simonelli, 2015). Acharya, Viral, Itamar Drechsler, and Philipp Schnabl (2014), “A Pyrrhic Victory? 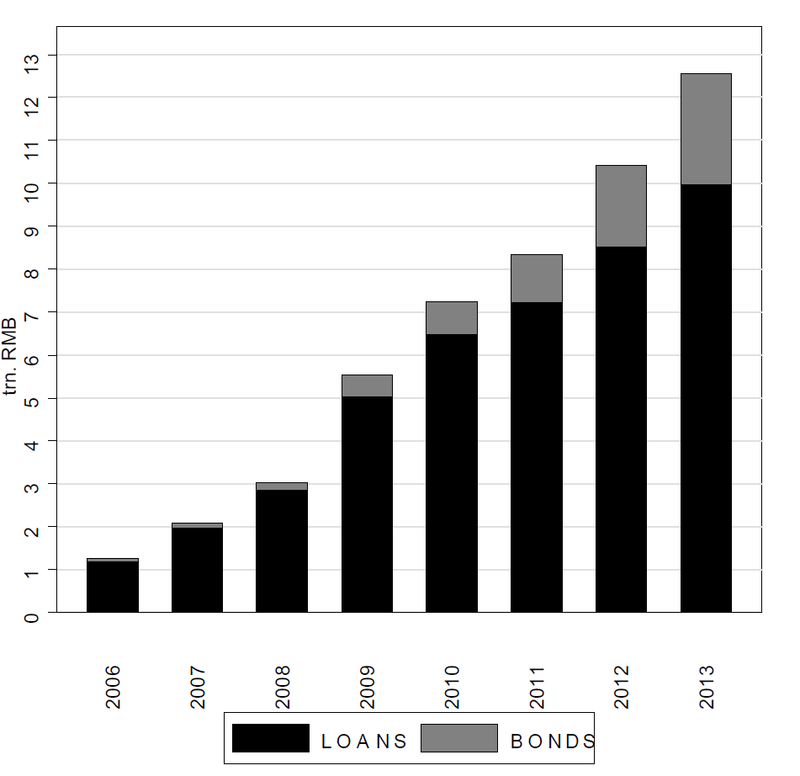 Bank Bailouts and Sovereign Credit Risk,” Journal of Finance 69, 2689-2739. Acharya, Viral, Jun Qian, and Zhishu Yang (2016). “In the Shadow of Banks: Wealth Management Products and Issuing Banks Risk in China,” mimeo, New York University. Agca, Senay, and Oya Celasun (2012), “Sovereign Debt and Corporate Borrowing Costs in Emerging Markets,” Journal of International Economics 88, 198-208. Allen, Franklin, Jun Qian, and Meijun Qian (2005). “Law, Finance, and Economic Growth in China,” Journal of Financial Economics 77, 57-116. Altavilla, Carlo, Marco Pagano, and Saverio Simonelli (2015), “Bank Exposures and Sovereign Stress Transmission,” CSEF Working Paper No. 410. Bai, Chong-En, Chang-Tai Hsieh, and Michael Song (2016), “The Long Shadow of a Fiscal Expansion,” Brookings Papers on Economic Activity, Fall 2016. Boyreau-Debray, Genevieve, and Shang-Jin Wei (2005), “Pitfalls of a State-dominated Financial System: The Case of China?”, NBER Working Paper No. 11214. Brandt, Loren, and Xiaodong Zhu (2007), “China’s Banking Sector and Economic Growth.” In China’s Financial Transition at a Crossroads, edited by Charles W. Calormiris. Columbia University Press. Cecchetti, Stephen, Madhusudan Mohanty, and Fabrizio Zampolli (2011), “The Real Effects of Debt,” Bank for International Settlements Working Papers No. 352. Chen, Kaiji, Jue Ren, and Tao Zha (2015), “What We Learn from China’s Rising Shadow Banking: Exploring the Nexus of Monetary Tightening and the Bank’s Role in Entrusted Lending,” Working Paper, Emory University. Chen, Zhuo, Zhiguo He, and Chun Liu (2016), “The Financing of Local Government in China: Stimulus Loan Wanes and Shadow Banking Waxes,” Working Paper, University of Chicago. Cong, Will, and Jacopo Ponticelli (2016), “Credit Allocation under Economic Stimulus: Evidence from China,” Working Paper, University of Chicago. Deng, Yongheng, Randall Morck, Jung Wu, and Bernand Yeung (2015), “China’s Pseudo Monetary Policy,” Review of Finance 19, 55-93. Dobson, Wendy, and Anil Kashyap (2006), “The Contradiction in China’s Gradualist Banking Reforms,” Brookings Papers on Economic Activity 37, 103-162. Dollar, David, and Shang-Jin Wei (2007), “Das (Wasted) Kapital: Firm Ownership and Investment Efficiency in China,” NBER Working Paper No. 13103. Elliott, Douglas, Arthur Koeber, and Yu Qiao (2015). “Shadow Banking in China: A Primer,” Brookings Economic Studies, Brookings Institution, Washington D.C.
Fatás, Antonio, and Lawrence Summers (2016), “The Permanent Effects of Fiscal Consolidations,” NBER Working Paper 22734. Firth, Michael, Chen Lin, Ping Liu, and Sonia Wong (2009), “Inside the Black Box: Bank Credit Allocation in China’s Private Sector,” Journal of Banking and Finance 33, 1144-1155. Hachem, Kinda, and Zheng Song (2015), “The Rise of China’s Shadow Banking System,” Working Paper, University of Chicago. Ho, Chun-Yu, Dan Li, Suhua Tian, and Xiaodong Zhu (2017), “Policy Distortion in Credit Market: Evidence from a Fiscal Stimulus Program,” mimeo, State University of New York, Albany. Ouyang, Min, and Yulei Peng (2015), “The Treatment-effect Estimation: A Case Study of the 2008 Economic Stimulus Package of China,” Journal of Econometrics 188, 545-557. Panizza, Ugo, and Andrea Presbitero (2013) “Public Debt and Economic Growth, One More Time,” VoxEU.org, 25 April. Reinhart, Carmen M., and Kenneth S. Rogoff (2010), “Debt and Growth Revisited,” VoxEU.org, 11 August. Roach, Stephen (2009), “China’s Great Contradiction.” In The Next Asia, edited by Stephen Roach. John Wiley and Sons. Ru, Hong, Haoyu Gao, Robert Townsend, and Xiaoguang Yan (2017), “Bank Competition and Growth: Evidence from China,” Working Paper, Nanyang Technological University. Song, Zheng, Kjetil Storesletten, and Fabrizio Zilibotti (2011), “Growing Like China,” American Economic Review , 196-233. Wen, Yi, and Jing Wu (2014), “Withstanding Great Recession Like China,” Federal Reserve Bank of St. Louis Working Paper 2014-007A.